So, yesterday was the 8th year anniversary of this blog. There were no parades, no rejoicing in the streets, and not even WordPress reminded me of the milestone. In prior years, I’ve summarized stats like the number of posts (1,841 posts not counting this one) and followers (1,273 followers) and the number of views (127,859 views) and the number of comments (19,838 comments). The first few years, I’d even do a demographic breakdown of the visitors and country map of their origins (I’m still waiting for someone from Greenland to look at even one of my posts) . . . wait . . . YES! Now, Svalbard, Cuba, Uzbekistan, Turkmenistan, Papua New Guinea, Botswana, Zambia, DRC, Central African Republic, Chad, Niger, Republic of Congo, Gabon, Equatorial Guinea, Burkina Faso, Liberia, Guinea, Sierra Leone, Guinea-Bissau, The Gambia, Senegal, Mauritania, Western Sahara, Somalia, and Togo are feeling the pressure. Well, Somalia has enough problems without me putting more pressure on them. I’m willing to give them a pass. Anyway, none of that this year; I’m kind of busy and I just don’t have the time. What I can do is point you to my Second First Post (the First First Post is just an introduction) as a way of remembering the start of this journey. What the heck . . . here’s a drawing I did last night as I was lying in bed waiting to get sleepy. Yes, it was done on my Note 8. This entry was posted in Opinions and Stuff, Writing Stuff and tagged Blog Anniversary, creative writing, personal musings, Stuff. Bookmark the permalink. Congrats! You started seven months before I began my journal. Thank you. I actually had other blogs in places that went away. Sad that . . . many of those posts were from a time when I was younger (obviously) and knew everything.
. . . so much wisdom lost . . .
YAY! Congrats! HAPPY 8th WP-iversary, Emilio! I’m so glad you are still blogging! It was fun to go back and read your first 2 posts! I could move to Svalbard or Greenland…you know…to help with your stats! Ha! Love your drawing! Did you then dream of mouses or spiders?! Thanks, and no . . . I actually had a dream of being in a house that was being stalked by a tornado. Like, the tornado kept coming back and ripping more pieces from the house. I didn’t really mind but I then got mad at someone who knocked down my mailbox.
. . . don’t know where that came from; never had anything like that before . . . Note to any psychoanalysts out there: no, I don’t really need that interpreted. I mean, besides the obvious that it has something to do with having intestinal gas, a dog named Toto, and stamps. HA! snort I think you already have the dream all interpreted your-own-self! Well, I’m just a layman; I might have missed a nuance or two . . .
Actually, I finally did get Greenland. Only one view, but that’s all I need for the country to register in the totals. Oh good! That’s what I thought, (by what I read) but my tired pea-brain wasn’t sure. Then I’ll move to Svalbard for you! Congratulations on your anniversary. I think every anniversary is a milestone and should be celebrated by opening up a can of SPAM and a Diet Pepsi. It’ll be a delayed celebration and sans-DP . . . but, yes, Spam a-plenty. Congratulations on your anniversary. I look on your blog as a continuation of the days and weeks and years of sharing our enjoyment of Firefly, Serenity, and The Antisocial Bastards, and the spirit in which we all participated with others who enjoyed it all as much as we did. It may be eight years later, but that sense of humor of yours still can make me laugh out loud. It seems like ages ago but it wasn’t really all that long ago. The world has certainly changed since then . . . so I’m glad I can still make people laugh. Wa-hey! I raise a tin of spam in congratulations to you. Thank you, Emily. It’s good stuff, so I’m also happy for you as I know it’s something to be savored. Our first interaction was on August 31, 2014, so no. By the way, you introduced yourself by complaining about one of my posts and expressed an inability to comprehend what I wrote. I knew then we were destined for a long relationship, me trying to enlighten you, and you stubbornly defying all such attempts. Per my e-mail notifications, the total number of interactions (not counting the multiple exchanges within each interaction) is 932, so much less than 4271 . . . although even 4271 seems low. However, I use Gmail and if I go to my Gmail account and search for all the instances of your e-mail, it brings up 932 e-mail conversations (conversations are comprised of single or multiple e-mail exchanges). Some of those e-mail conversations are notices of you responding to comments I left on your blog and some are personal correspondence we’ve had, but the bulk of those notices are comments you left on my posts. “I read it all but I’m damned if I knew what you were talking about most of the time, me, I just blog away nobody visits my pages, except for a couple of close friends who feel obliged to to keep me happy, or perhaps to humour me in my dotage. I assume that makes sense to you, but perhaps that’s a bad assumption. As far as praying for me, a much better target for prayer would be children that are dying from disease or famine. Just saying. I hope that I haven’t misunderstood your irony and it’s okay for me to like this post! It’s always OK to like this post. It’s other posts that are iffy. You’ve got so many elusive countries, Greenland, Mongolia, Svalbard. I’m so impressed! How do you do it? Still waiting on Svalbard . . . as for the rest, I can’t take credit for any of it. 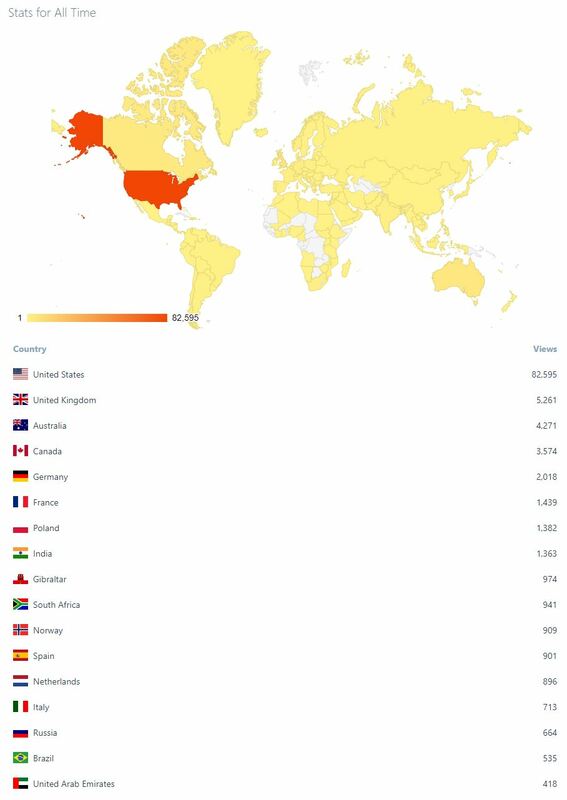 I’m assuming in each of those countries someone got drunk and accidentally wandered onto my site before realizing what they were doing. Pure dumb luck, really . . . and the power of alcohol. That’s exactly how I think it happens lol.